Recently, Calvy read me a news story about the Karnataka Tourism Minister (Mr. Gali Janardhan Reddy) who ‘gifted’ a 42 crore worth of a diamond-studded crown to the ‘GOD’! I understand the fact that the minister is a mine baron and has obscene amounts of currency at disposal yet I wonder, pardon me if I sound naive, why would god need such a gift? The dogged intuition that I inherited gives me this much of an insight that Gods don’t crave for materialistic desires…the halo over their head requires no diamond studded crown to add sheen to its aura. What can a human offer to the great one? I thought it was in camaraderie and cordial coexistence of species that God would have drawn a probable gift from us. Benevolence is often misinterpreted to be lavish show of money in sanctified places. Be it Jesus or Jagannath,Mecca or Mathura, trillions worth of offerings are made to the supreme being…all in the name of religion or god, misunderstood sometimes as the ticket to heaven such donations which in no way can add to the lord’s bank balance, only show the hideous state of careless and crippled orthodox minds. I’m quite sure that god would have loved it more if that gift was used to feed the poorer section of the society, which laments in all seasons without shelter and is forced to live on meager handful of grains. I’m not advocating to sign claques for animal welfare…if humans have no heart for their own species then expecting them to take care of others is way out of the line. Philanthropy, I guess is long forgotten. Call me an atheist, if you wish to, but I’d always believe that kind acts that touch a soul are way greater than the money vested in driving faux displays of piety. I would always stand by my beliefs that direct me to believe in actual efforts rather than reciting rituals. The only ticket that’s accepted at heaven’s gate has a price that no denomination can buy; it’s with your acts that you become owner of one. Posted on June 18, 2009 August 24, 2017 Author DogCategories Grrrr.....Tags a gift for god, diamond crown, in sensitive, karnataka, lord balaji donation, minister gifts god, rich MLA, rich temples india, tirupati donation6 Comments on A gift for God! There is a reason why Dog spelled backwards is God. Dogs and their reference in the mythology, as old as art itself, keep looking at us with ironical discomfort. In a society where religion dominates the psyche why not have the positives from the religion? The gods certainly don’t need gold, do they? In ancient Egypt, the jackal-headed god Anubis was the god of the dead, protector of the afterlife. Closer home in India, Hinduism believes that dogs guard the doors of heaven and hell. Shvan (Sanskrit word for dog) is often mentioned in Vedic texts as a deity and associated with Hindu God Bhairava. The epic Mahabharat has a story on how Yudhisthira had approached the heaven with his dog. Dog spelled backwards is God! In China, the dog is one of the 12 animals honored in Chinese astrology. The second day of the Chinese New Year is considered to be the birthday of all dogs. The Catholic Church recognizes Saint Roch (also called Saint Rocco), as the patron saint of dogs. The legend has it that caught by plague while doing charitable work he went into the forest, expecting to die. There he was befriended by a dog which licked his sores and brought him food, and he was able to recover. The feast day of Saint Roch, August 16, is celebrated in Bolivia as the “birthday of all dogs.” St Rochus (St Roch) and his dog are often depicted together in paintings and statues throughout Europe. 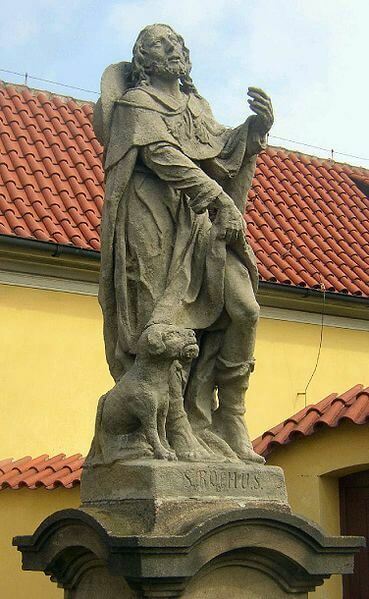 St Rochus is often depicted in statues and paintings with his dog. Maybe we are looking at it incorrectly. Dog is not God spelt backwards, God is Dog spelt backwards.